Did I mention how much I absolutely love the apprentice program by the Professional Doll Makers Guild? If I haven’t mentioned it already, I absolutely LOVE IT! As a beginner ‘realistic’ sculptor I often have questions. 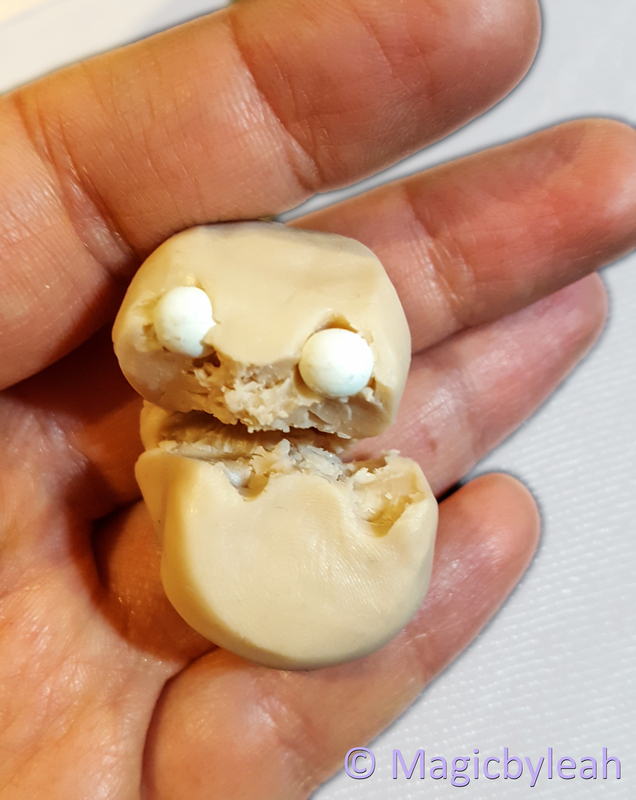 I’m still getting used to anatomy and general sculpting features. Being able to ask questions and get feedback every step of the way helps me understand my weak areas despite not being able to catch it on my own. 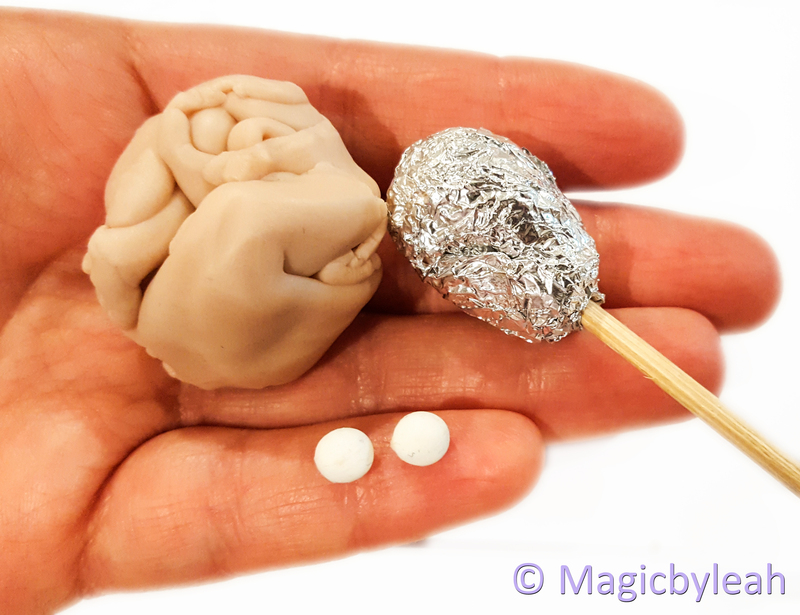 Even more exciting is the new challenge – to sculpt a full figure mermaid. 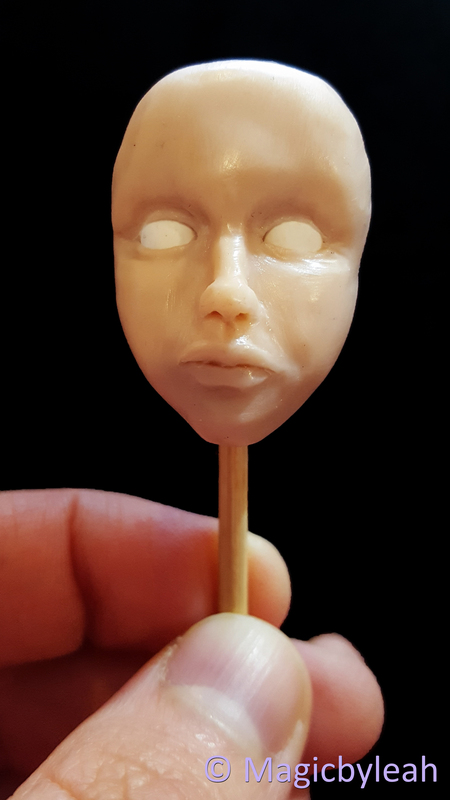 Safe to say this takes me WAY WAY WAY out of my comfort zone having never sculpted a full figure before. Unless you count this little mermaid. Heads and faces are tricky! 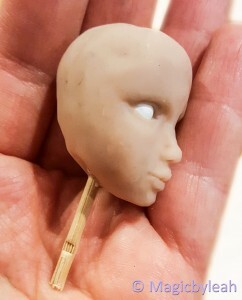 This is one of the first things you see when you meet a person, and this is the first thing I work on for my dolls. 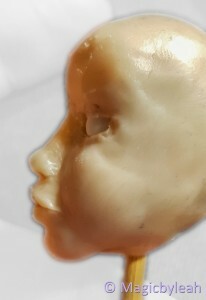 But faces are so unique and complex that it takes a lot of trial and error to get it right. I chose to use 100% prosculpt for this project. Prosculpt was created by a doll maker FOR dollmakers and touted to be a superior clay. 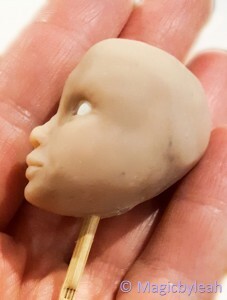 I’ll see this project through and then determine if I like it better than my previous go to: living doll and Premo Sculpey. 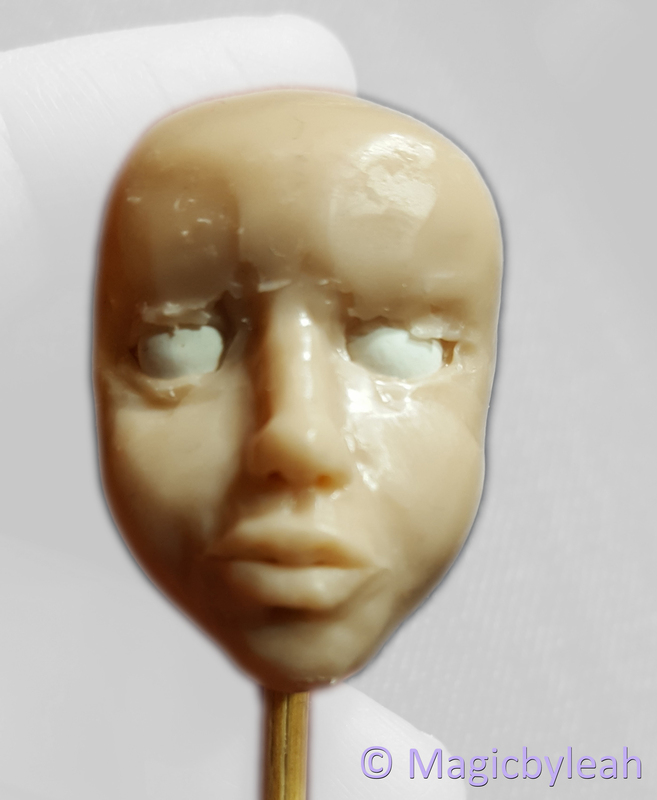 I experimented with a new armature format for this head. 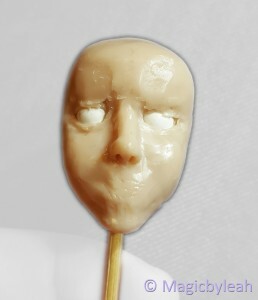 Instead of sculpting on wire I sculpted on a stick. 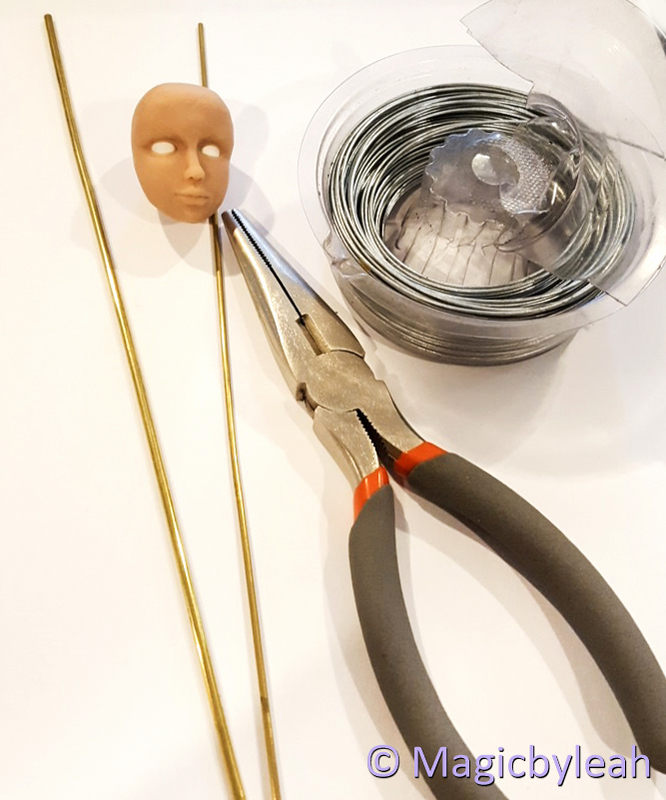 This will allow me to slide the head onto a wire armature after baking. 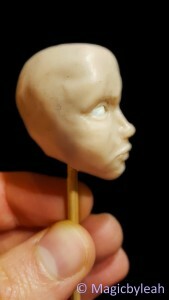 I started with the basic shapes focusing on the skills learned from my previous mentored face sculpt. I sculpt very slowly and tend to get lost in the details I complete. 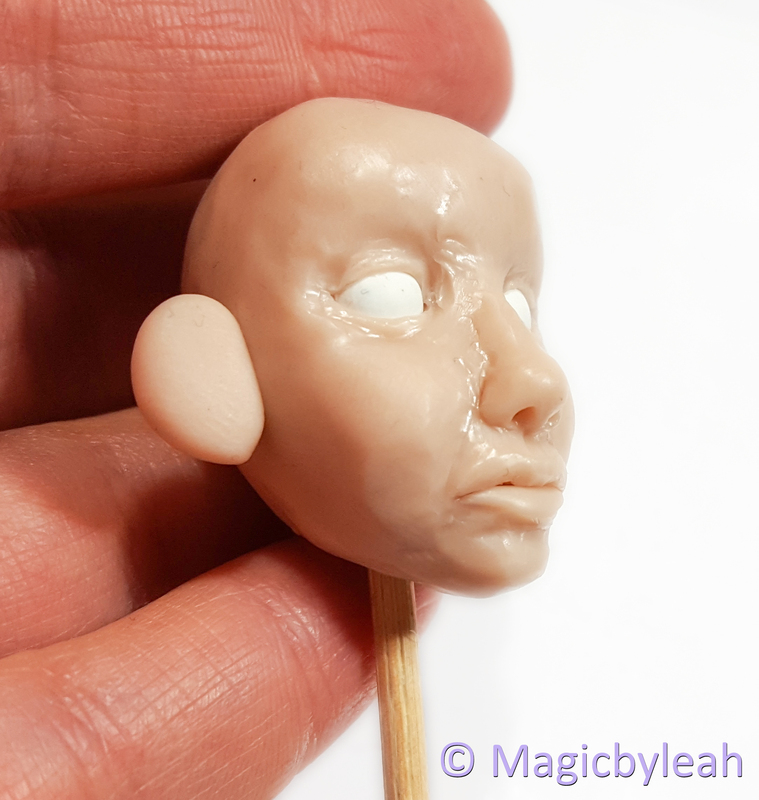 I added ‘fake ears’ to get an idea of how she’ll look with ears. I plan to add these much later. When I finally kinda/sorta get the details right I can’t see past the flaws and simply want to MOVE ON! That’s what makes this process so challenging. This is just some of the tweaks I made over the next few weeks. 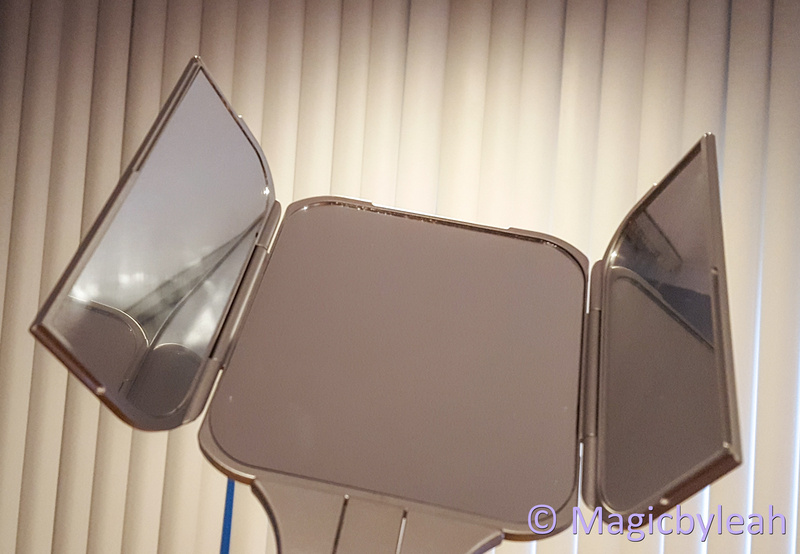 I also invested in a new standing beauty mirror. 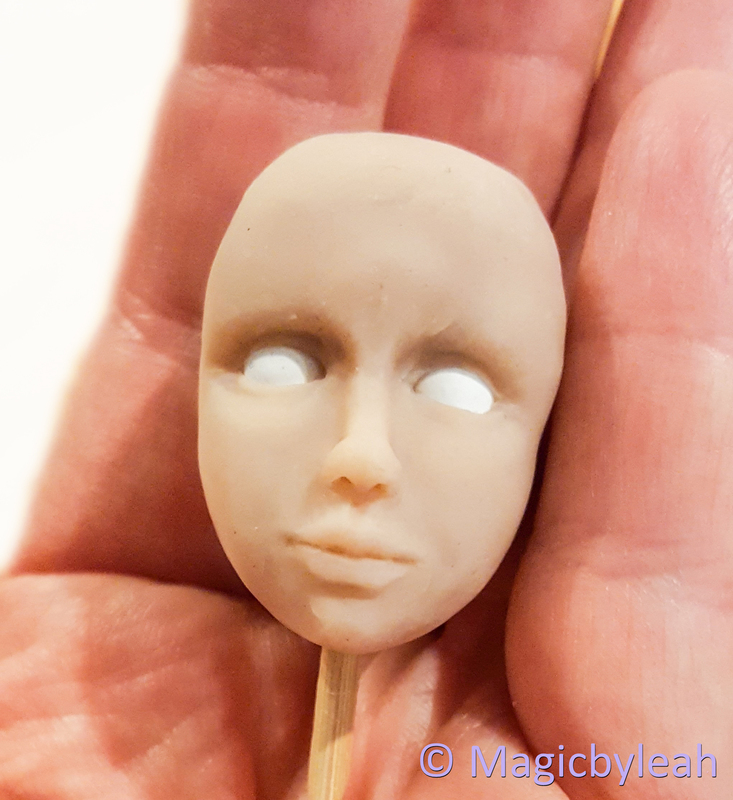 While I still find this step uncomfortable, sculpting with a mirror will help you see both sides of your face sculpt at the same time. This helps ensure symmetry of features from the start. Unfortunately, this is still a big issue. 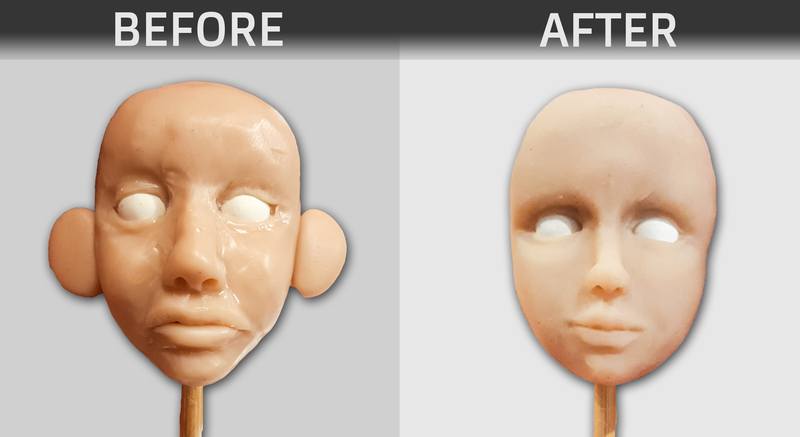 I tried very hard to maintain a clean working environment and meticulously removed as much lint and fibers from the face as possible. I gave up on the back of the head since it’ll be covered by hair anyway. I also didn’t pay much attention to moonies before. moonies are caused by tiny bubbles of air trapped in the clay. This happens when you condition clay by folding pieces over, or by simple adding more and more clay. The air is hidden in the raw clay but expands in the oven when exposed to curing temperatures. 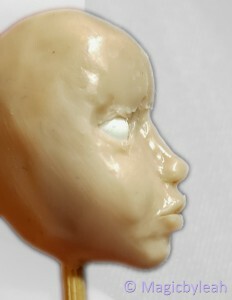 The expanding air has enough pressure to force its way out of the clay forming little cracks in the process. 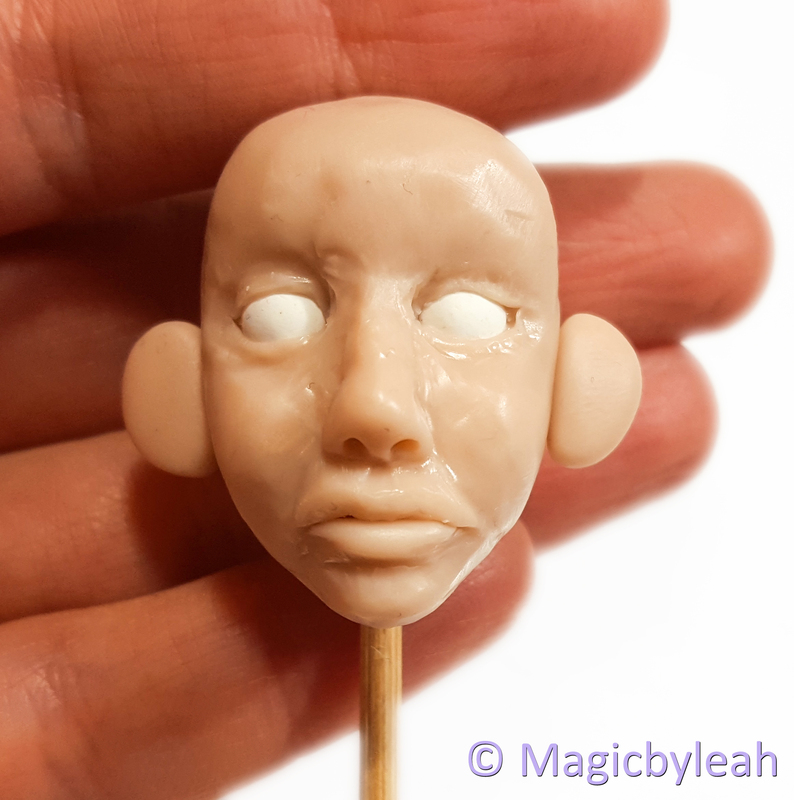 I haven’t really experienced this before when working with Premo sculpey and living doll. I also haven’t worked this hard on something before. Is it a result of using prosculpt over sculpey or the technique itself? I’m not ready to make a decision. While there are many options for fixing it I’m choosing not to fret the flaws and focus on the wins. I don’t plan to sell this sculpture and therefor do not risk disappointing any collectors. Your doing very well leah! Keep up the fab work and of course taking time for yourself is crucial..enjoy your journey and keep the updates coming, looking forward to more pics of your work! Great work enjoy your work. I am going to try your pumpkin scare crows for fall.